Through the course of a day, it isn’t uncommon for a lot of people to have to change clothes several times. Between the gym, work, and after-work events, it seems like we need portable closets just to keep our clothing changes close at hand. Vernon Chen and Joanne Lim Jin Xuan have an idea that would make it much simpler to get through the day without worrying about wardrobe changes. 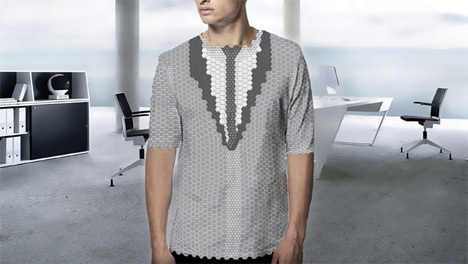 The Plexus Shirt is envisioned to be a unique piece of clothing that features opening and closing louvers – sort of a shirt made of movable scales and held together by pixelated nanoparticles. It can start out the day as a workout shirt with enhanced air flow thanks to several “scales” being tilted open. 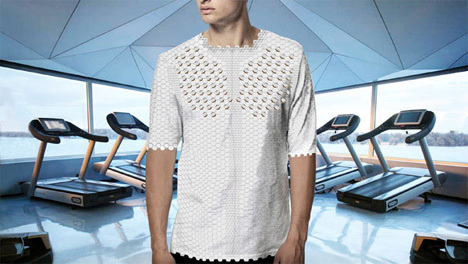 After your workout, the shirt can rearrange itself into a business-appropriate garment. It can even change colors depending on your tastes and the surroundings. Of course, clothing like this is just a concept for now, and it may never actually enter the realm of reality. But it’s fun to imagine walking into a room and watching your outfit morph into the perfect look for the setting.